The interest rate swap (IRS) market is the largest derivative market. The size and continued growth of this market is really impressive: the article shows statistic across all OTC derivatives where IRS outstanding notional amount is $425,569 billion as of June 2013. •	Floating leg payer (receiving the fixed rate) is said to be the seller. Floating rate benchmark is based on 3 month LIBOR rates, Act/360 convention. For each leg of a swap, Accrual Start/ Accrual End date, Pay date and Reset date must be defined. Each leg of a swap is comprised of calculation periods. In our example we consider a 1-year USD swap that has 2 semiannual calculation periods on the fixed leg, and four quarterly calculation periods on the floating leg. Also, we define modified following roll conventions, a holiday date is adjusted to the next good business day, unless it rolls into the next month, in which case, the date is instead adjusted backwards to the last good business day. Swap pricing is based on the zero coupon and forward curve. These curves are derived by using bootstrapping . The valuation is simply computing the net PV of the fixed and floating legs. IRS is priced so that it has a net present value of zero, so called par swap. We use the same curve as previously in our bootstrapping example, US-dollar interest rate swaps, YCSW0047 Index in Bloomberg, but with one main difference. Our curve was constructed of EDs contiguous futures (March, June, September and December months). As we pricing a 1-year swap we would like to have more market data for 1 year period. Therefore we use serial futures instead – March, April, May, June, July and August. Let’s illustrate logic of the code above and consider Payment Date to be equal Accrual End Date. Now, let’s evaluate each leg and the final NPV payments. Floating leg has reset days, where the first rate is our actual Libor 3M rate, the others are forward rates. The output of the program below shows NPV is -$0.59 (Our swap fixed rate is 0.483153%) and this is an off-market swap, one of the counterparties needs to compensate the other the NPV. We used the NPV() function in our code that gave exactly the same NPV result as we got in our calculations in the table above, NPV() = Sum = -$0.59. The result is 0.483147% and the NPV is equal to zero (which means PV of fixed leg is equal to PV of floating leg), i.e. “No losers, No winners at the beginning”. Nice explanation. Just got a question on payment date. 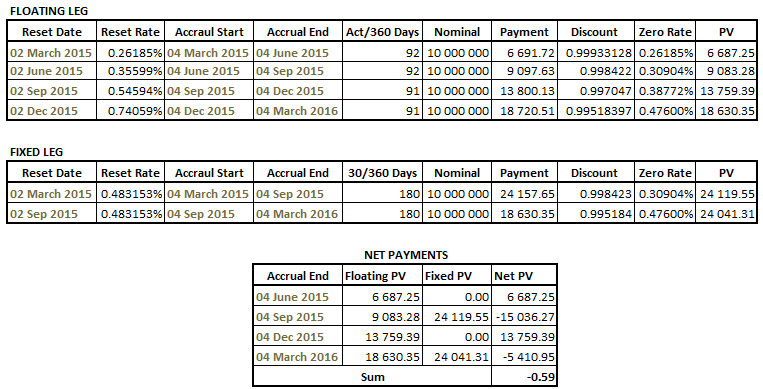 The payment date is assumed to be the same as accrual end date. In practice, there are some swap contracts have payment dates different from the accrual end dates. For example, the payment dates for some OIS swap are normally 2 days after the accrual end dates subject to normal business day convetion. How does Quantlib handle this issue? To be honest, I thought Quantlib could handle this issue automatically. sets payment T+2 and also adjusting a date whenever a payment date falls on a holiday.